Ranked high on most visitors' must-buy list, tailor-made clothing in Thailand is an excellent choice, especially when you can't seem to find a perfect fit in ready-to-wear shops. Famed for their swift sewing and competent craftsmanship, tailors in Thailand are trusted and chosen by many to have their clothes made the way they prefer. Although choosing a good tailor can be a daunting task in Thailand where tailor shops are ubiquitous, with a bit of careful planning and research it's not impossible. Don't fall for cheap packages or special deals advertised in glossy brochures advertising a suit, a pair of trousers and two shirts for, say, US$ 95. Chances are good you'll end up paying much more than what you wanted to and having to settle for inferior quality. If you don't know where to go, your hotel should be able to give you a few pointers, but do not take their word for granted. 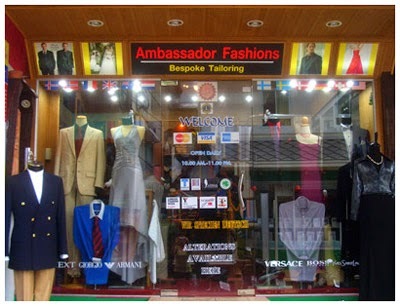 Many of the bigger hotels also have a reliable, good quality service on the premises for tailor-made clothing. You may want to consider those shops, but then again, I would advise you to do your research before you decide to use their service. To save time and energy, and if you have a specific design in mind, make sure you arrive at the tailor's equipped with something for them to copy. Ask to see some examples of their work. Inspect the stitching, lining, quality of fabric used and general workmanship . Unless you really don't have anything to wear or are pressed for time, the ready-in-24-hours option should be avoided. Bear in mind that proper tailoring does require time and patience to ensure desirable results. It pays to do your homework before making your first appointment with a tailor. If you are lucky you will get a recommendation from somebody you know who already uses a tailor. A good tailor will always listen to your requirements and then advise you of what will work best. It is also important that you please use your best judgment if you are being convinced by local taxis to take you to a reputable shop. For how long is the tailor in the business? This will let you know how much experience they have. Many companies these days employ salespeople who may only have few weeks training before being sent out to visit clients. How many time do you have to fit the clothes? If they make the suit straight through (i.e. measure you and then the next time you meet the suit is ready), it probably is factory made. Nothing is wrong with that as long as the price reflects this and you have not been overcharged. Fittings are a way of checking that the garment will fit precisely. It is at this time that any alterations can be made easily (ie. the length of the sleeve, movement through the back, etc). Some tailors will offer more than one fitting at an advanced stage of production. The number of fittings does not correlate to the quality or fit of the finished garment. What is the type of fabric that they can offer u? The first thing to do when you meet your tailor is choose a fabric. Before you consider design and colour you need to think about the weight and type of fabric and what you will wear it for. Cloth is manufactured in many different weights and many different compositions, traditionally measured in ounces. Fabrics generally range from 9oz lightweight fabric to 17oz or above for a heavier fabric. You can get heavier and lighter fabrics, but in these days of air conditioning, central heating and global warming you should find what you need in this range. For those of you who work in grams, a simple conversion guide is 30grams = 1oz. A good, all year round fabric in England would be around 11-12 oz with 9oz being good in summer and 13oz good for winter. In countries with different climates you can go heavier or lighter. Traditionally Yorkshire is renowned for manufacturing good quality worsteds, sometimes mixed with other fabric (i.e. cashmere), these cloths will last for years. This is due to the strength of the fabric when woven. All weights are woven in different qualities. Generally tailors will only use the best fabrics as even a novice can tell the difference when feeling the different cloths.